The company was founded in 1952 as a partnership. The small die shop designed and built tooling for the automotive, hardware, and appliance industries located in the Jamestown and Buffalo, New York, areas. 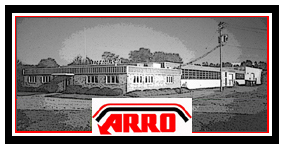 Arro Tool & Die incorporated in 1964 and continued to supply tooling to the major industries in western New York. In 1970, the Company built a new, 16,000 square-foot facility on ten acres of land in Lakewood, New York. In this new facility, the company increased its capabilities to include a stamping operation. In 1997, Arro Tool & Die, Inc. expanded the facility again, making it 20,000 square feet. This expansion took place to increase the space available for the stamping operation and to add additional press room equipment to the plant. In 1999, Arro added another 3000 square feet to keep up with the spatial needs of the stamping operations. In 2011, Arro added another 2000 square feet to accommodate the purchase of a new 600 ton press. Since 1952, Arro Tool & Die, Inc., has grown from a two-man die shop to a multi-faceted manufacturing facility with diverse capabilities. The company designs and builds all types of stamping dies, fixtures, prototype tooling, and special machines. In addition, the plant has a stamping facility with presses ranging from 15 to 600 tons.